Sacramento hot summers are good reason enough to take a dip into the pool all season long. Or even better, to learn and engage in swimming itself – a healthy, full body activity that helps to keep children and adults fit while having a little (okay, a lot of) fun! Swim lessons at our health clubs are taught by certified Water Safety Instructor (WSI) and Aquatics Swim Instructor (ASI) teachers who conduct classes in private and group settings. 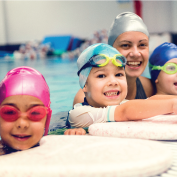 Swim lessons are available for all ages and abilities, including for kids, toddlers and babies. Q: Why should I consider swim lessons? Q: When should children learn to swim? A: The short answer is ASAP. 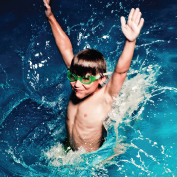 Children as young as 3 months old are encouraged to get a head start on safety swim lessons. School-aged children can go beyond learning to love water and into the fundamental skills taught at this age of which great swim technique is built upon. Older children and teenagers can be taught beginning instruction, improve and conditioning techniques, and help with exercise and overall health. Q: What should I do if my child cries and is afraid at swimming lessons? A: This is quite common occurrence. The best thing to do is to acknowledge that you understand your child is afraid and tell him/her that you know that they can do the things that the instructor is asking them to try. Stop by the pool at a time other than swimming lessons, and even prior to the first day of class, so the environment will be familiar. Be persistent with your child and don’t give up! Q: Why is my child not learning and progressing in the lessons as quickly as some of the other children? A: Children will progress at their own pace, and usually not at the pace of the parent or other children in the class. Children sometimes reach developmental plateaus due to body type, a growth spurt, muscle development or the child’s motivation to be in the class. Continue to encourage your child (and remember yourself) to be patient and to spend some time enjoying the skills that the child has already mastered. Q: Why is the instructor playing a lot of silly games in the class? A: Children learn through play, so games and songs are used to reinforce skills taught through lessons. Q: Should my child use goggles while learning to swim? Goggles are a good option for children three years old and older during swim lessons, but only if they fit well and don’t leak much.